Konaseema. The lush bucolic countryside of Coastal Andhra. ‘Kona’ for corner, this land wedged into a corner surrounded by water, is one of the most fertile deltas of Southern India. The Godavari river keeps you company, as you Road Trip through these idyllic coastal towns. Known for its beauty, Konaseema has been depicted extensively with its swaying coconut trees and green backwater canals. But, how best do you enjoy this beauty? For it is no tourist destination like Kerala where houseboats abound aplenty on the backwaters. 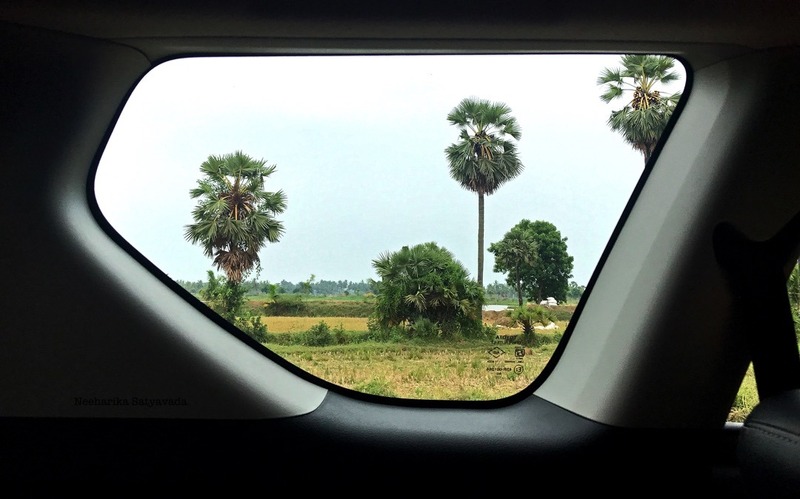 So here I chose one town, rather a small city, Kakinada and put together a two day itinerary for a road trip through Konaseema, that include visits to beaches, ancient temples and artisan villages. Story goes.. There was once a powerful asura (demon) Tarakasura who was at war with the gods and thanks to a boon, he could only be killed by a son of Lord Shiva. So there began a battle between him and Kumaraswamy, Shiva’s younger son and Lord Ganesha’s brother. But, at every deadly blow, the rakshasa, Tarakasura would reform limb to limb from his cut off body parts. This power to reform came from a Shiva Linga that the demon wore. So the only way to destroy him was to break the lingam first. Eventually, there came to be five pieces of this Siva lingam and these fell in five different places in Andhra Pradesh. Temples were then built in those locations around the fragments. Those five ancient temples now constitute the Pancharamam. & Kakinada happens to have two of those in driving distance. All the pancharamam temples are two storeyed stone temples for they are all home to massive Shivalingas. To continue the story, the five fragments were installed and worshipped at five temples by the five gods, Indra, Surya, Chandra, Vishnu and Kumaraswamy. This one near Samarlakota was by Kumaraswamy himself. & the temple itself is beautiful, peaceful and not too crowded. Probably the biggest and definitely the most celebrated of the five is Draksharamam, a pancharamam and also a shakti peetham. This 10th century temple has a rich history of mythological legends associated with. It is even believed to be the site of Dakshayagnam and that Daksha’s daughter Sati is none other than the Goddess Manikyamba who is alongside Shiva in this temple. Making it one of the major asthadasa shakti peethams in the country. In Annavaram is a small hill, Ratnagiri, which is home to the temple dedicated to Lord Satyanarayan Swamy. A form of Lord Vishnu, that all Hindus worship at weddings, housewarmings and all important social occasions in one’s life. Making this a pilgrimage centre that is second in popularity only to Tirupati. The famous handcrafted Jamdani silk sarees come from here. Need I say more? Getting There: Every place on the itinerary is less than an hour and a half from Kakinada. Highway Pit Stop: One. Foodcourt near Annavaram. Stay: Paradigm Sarovar Portico. Comfortable and centrally located. Vegetarian Restaurants: Subbaya’s Hotel, Bhimas. I bet you had a marvelous time on this road trip! The countryside is so lush! Yes, loved the experience. 🙂 So different from all those roadtrips from Hyderabad through the arid Telangana. Beautiful pictures and looks like an amazing road trip! Love it! Thank you! ☺️ Yes it was a beautiful roadtrip.. the countryside, the coconut trees & the beach. Thanks for taking us this virtual journey.